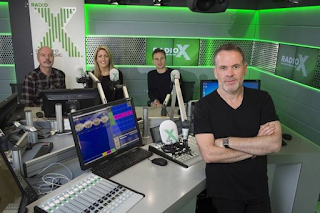 The return of Chris Moyles on new station Radio X crashed the station's website and App as listener demand exceeded expectations. The former BBC Radio 1 DJ joined Vernon Kay and Johnny Vaughan as part of the new line-up for Radio X, the former XFM in possibly the biggest event for digital radio, even bigger than the recent launch of Apple's internet station Beats 1. But demand for the new station outstripped supply with numerous listeners failing to hear Chris Moyles' debut. Radio X is only available in London and Manchester on FM, listeners elsewhere have been dashing to switch to DAB digital radio and other digital platforms to listen to the station. Read more about how to get Radio X on DAB digital radio here. Some former XFM listeners weren't happy about the loss of their morning dose of indie music, complaining there was too much talk. But those listeners were outnumbered by those eager to hear Chris Moyles back on breakfast radio after three years, where he was joined by newsreader Dominic Byrne and his former Radio 1 producer Pippa Taylor. Chris Moyles shrugged off criticism that Radio X would be only for blokes by playing Girls Aloud’s Love Machine as the first track of his show. The announcement that Radio X would be a male-skewing station appeared to touch a nerve with some, despite owner Global Radio operating numerous so-called female-skewing stations. Global has four female-skewing stations (Heart, Smooth, Gold, Capital and Capital Xtra) and two male-skewing stations (Radio X and LBC). Classic FM enjoys near equality with a 49/51 split between male and female listeners. According to Global Radio, 58% of listeners to Heart and Capital are female. In contrast, Radio X’s predecessor XFM had 63% male listeners and 37% female listeners. Global Radio itself avoids the controversy in its marketing material, where it describes Radio X listeners as "loyal and enthusiastic." They go on to say: "as music fans, they’re passionate and supportive. And as an audience, they’re exactly what advertisers crave. They go to gigs, live events and club nights, they have taste when it comes to music culture, cinema, video, gaming and exhibition, and they’re the kind of people who help form opinions across the world of music and entertainment." Of course, the terms ‘male/female-skewing’ is a term that advertisers love, as they like to pigeonhole listeners into different target groups, and commercial radio operators in particular like to create stations for such pigeonholed listeners in order to create a product that advertisers love. TV companies do the same - Exhibit A: ITVBe. Away from any marketing blurb, the music or content is key - and fans of the genres of the music each station plays come from all backgrounds. Interestingly digital radio offers a greater choice of so-called male-skewing commercial stations outside of London, where the likes of Radio X, Absolute Radio and LBC are not on FM.